Opening a restaurant is almost everyone's dream but simply being a good chef is not adequate in the restaurant space today. To survive you need to know how to cook food as well as how to sell food, maintain the sales and then count your sales. Regardless of whether you are not an accountant to make due in the restaurant space today, you need to at least be prepared with the numbers game a little to ensure you recognize what is happening and what is not. To make it simpler for you, here we have some restaurant accounting tips for you to look at so that next time the accountant comes, you know your end data thoroughly. Here is a list of tips that you can follow to manage your restaurant finances better and know what your accountant is doing. Understanding the Terms: Approaching people for advice is one thing, and understanding it is another. Keeping in mind the end goal to effectively ace your restaurant accounting, the best course of action would be to learn the language of accounting. Words like debit, credit, balance sheet, cash flow which seem like gibberish right now are common vocabulary in the accounting sphere which you as an entrepreneur must be comfortable with. You do not have to become the accountant yourself yet simply understand the basic rules and terminology so you can comprehend what you are doing completely and what your accountant has been doing from the beginning. If you comprehend their language you will be able to work better with them and accounting for day to day will get simpler for you. Be Accurate: While you might be tempted to round off a couple of rupees here and there, do not do it. Indeed, even a single rupee every day makes a huge difference and though the figure may appear to be small, it will mess up your analytics, records, income or expense count and taxes. Observe each rupee to know precisely what your profits or expenses are. This is particularly important as overestimating your costs can influence you to miss out on great business openings though underestimating them can lead you head on to a financial crisis. Book-Keeping: Record for your restaurant expenses and sales daily. Make it a habit, that way it is less taxing and you have a better thought of how the tasks are being run. Soon you will start seeing patterns, similar to specific days which are moderate, specific dishes that do not sell etc. With these revelations, you can further optimize the way you strategize for your restaurant as you will able to see in numbers what is working and what is not. Know Your Expenses: Next, to successfully account for your restaurant finances, you have to comprehend what your costs are- Fixed and Running. Fixed costs are those which remain the same. These include things like rent, depreciation on hardware, salary etc. Running expenses also called variable expense are those which are important to run the restaurant, however, keep changing, like electricity bill, cost of spilled food, water bill etc. Having a learning of these costs will make it easier for you to account for them and eventually control them over the long run. We understand restaurant accounting can be a hefty task, especially if you are not a fan of numbers and calculations but today a restaurant is never again only a food service provider, however, a business and like each business, accounting in a restaurant is an absolute necessity. We prescribe investing in an efficient restaurant management solution will clearly enable you to get out of this trouble. 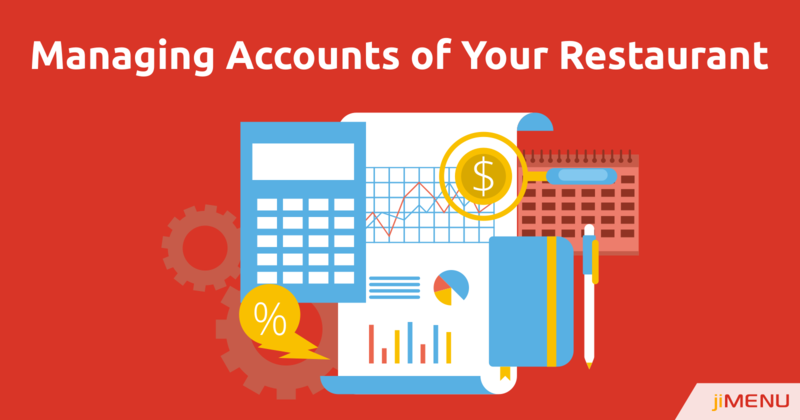 We hope these tips help you out a little next accounting season.